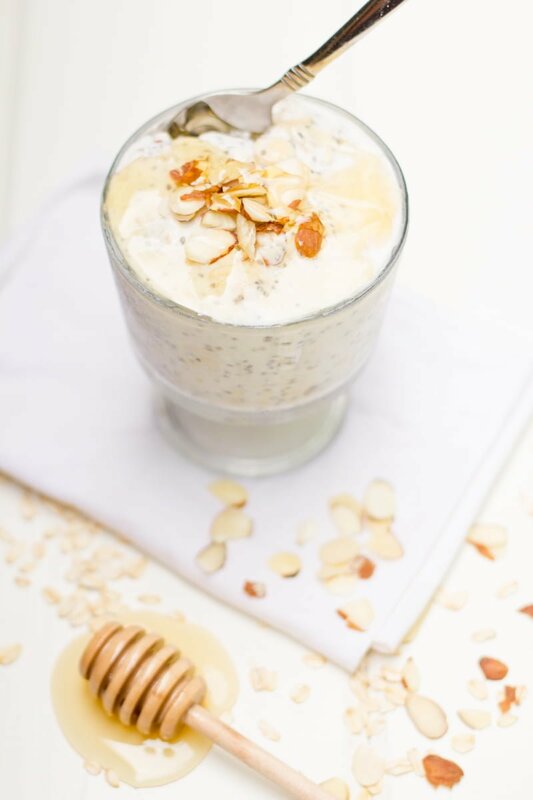 Beautifully simple, these Toasted Almond and Honey Overnight Oats are the perfect way to have a healthy, whole grain breakfast on a hot summer day. I’ve had so much fun showcasing some of the great products from Blue Diamond for you guys this week! In case you missed it, I used their crunchy, flavorful Nut Thins to dip some Salmon Spinach Artichoke Dip. And tossed in some of their oven roasted almonds into Salted Almond and Dark Chocolate Ice Cream. And now, we’re going to end this Blue Diamond takeover with one of their newest products on the market—their Hint of Honey Almondmilk! I love this product so much! 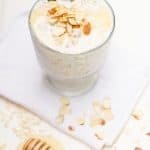 I’ve always liked using sweetened, flavored almondmilks in smoothies, oats, and cereal, but it’s always been just a touch too sweet for my tastes. Usually, I cut the sweetness by mixing half sweetened with half unsweetened—no need to do that anymore! Almond Breeze Hint of Honey is just a little bit sweet (and with just a little bit of honey flavor), making it absolutely perfect. I’m in love! Now that the weather is heating up, I’ve made the switch from eating hot bowls of oatmeal over to eating overnight oats. 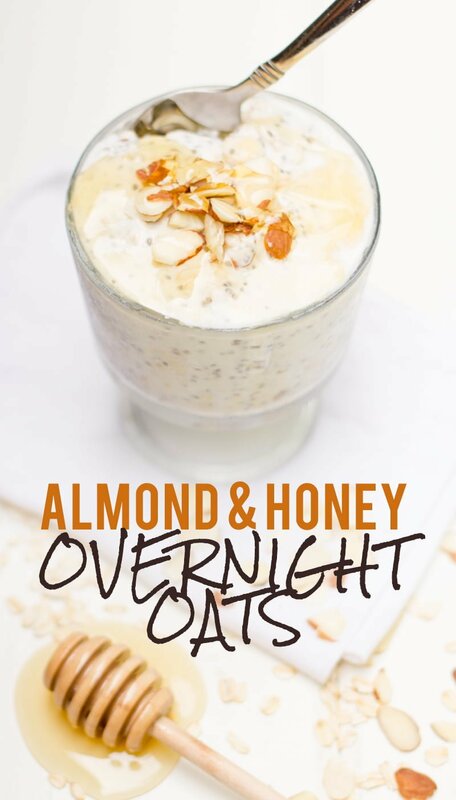 If you’ve never made overnight oats, they are super easy and fun to make—and require no heating whatsoever! By letting the oats rest overnight in the fridge, they get soft, tender, and soak up the liquid you use—and the flavor. They are awesome! It’s basically like eating a healthy pudding for breakfast. One of my favorite parts of making overnight oats is that they are the perfect option for make ahead breakfasts. Overnight oats are almost always part of my food prepping days. I make up a large mixing bowl of overnight oats, and then portion it out into pint-sized canning jars. Then I stash them in the fridge, and I have a whole week’s worth of grab and go breakfasts in the amount of time it would normally take me to cook a bowl of hot oats. There are a lot of amazing, layered, complicated overnight oats recipes out there, and this one isn’t one of those kinds of recipes. It’s beauty is in its simplicity! 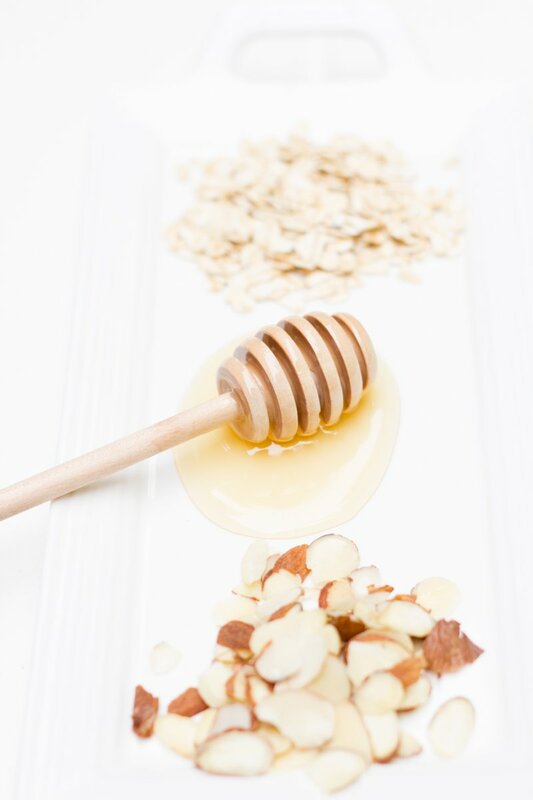 It has a wonderful, creamy, and sweet oat base with nutty toasted almonds and rich, golden honey. I’d recommend throwing some seasonal fruit on top—I tossed on a couple of the 70 pounds of strawberries we picked this week (more on that later). It’s such a fantastically simple and perfect summer breakfast. This recipe relies on chia seeds to do a lot of the thickening overnight in the fridge; if chia seeds are hard to come by in your area (make sure you really look—even my small town grocery store carries chia seeds now! ), ground flax meal will work as well, but it will add a more intense nutty flavor to the final oats. If you can’t get your hands on chia or flax, just add in a couple extra tablespoons of oats—the final result might not be quite as creamy, but it’ll still be delicious! Enjoy. In a small skillet, toast the almonds over medium low heat until just barely brown and fragrant, about two minutes. Remove from heat. 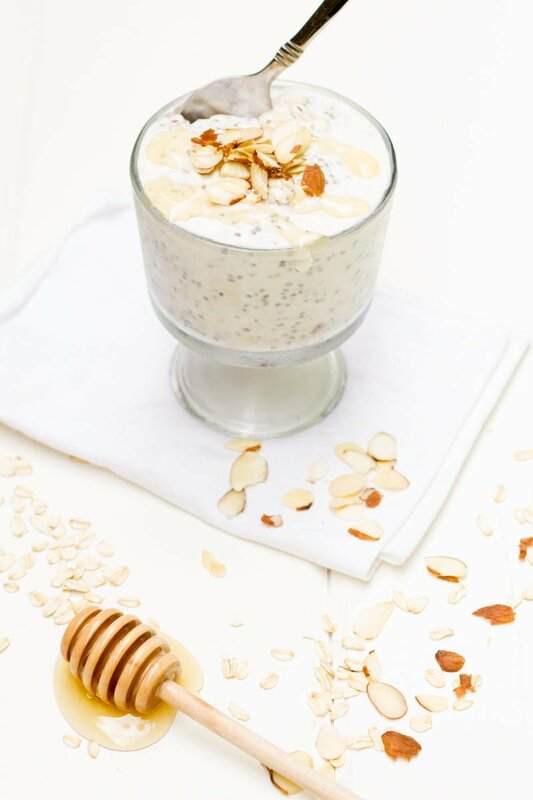 In a small bowl, mix together the almonds, oats, yogurt, almondmilk, chia seeds, and salt until smooth. The mixture will be quite liquidy. Transfer the mixture into a serving bowl, cover, and refrigerate for at least four hours, but preferably overnight. Top with honey, fresh fruit, and more almonds before serving. For as long as bees have been building hives, people have been drawn to the taste of honey. Who can blame them? Honey offers a subtle sweetness that can satisfy any craving. 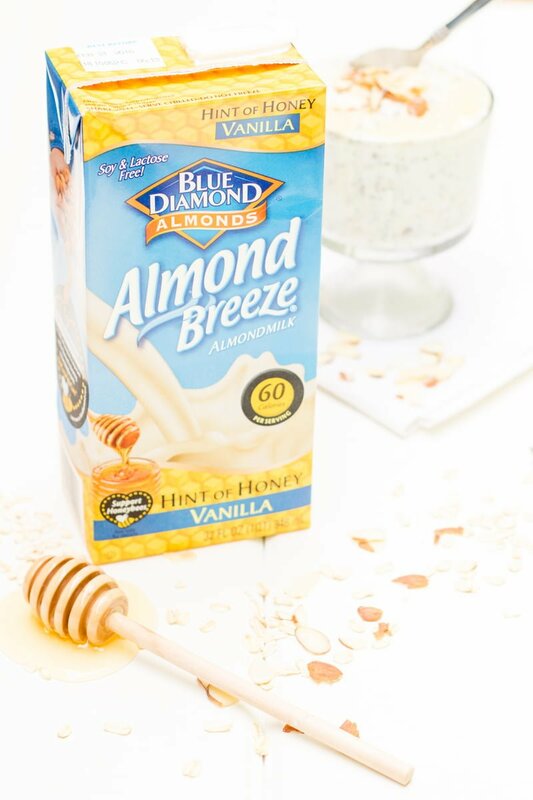 Almond Breeze “Hint of Honey” has a rich & creamy taste and is available in 64 oz. refrigerated and 32 oz. shelf stable product sizes. Thanks to Almond Breeze for making this post possible. All content and opinions are my own. They look delish! I’m going to make these today!